Food markets are here to stay at the South Street Seaport. That was the announcement City Council Speaker Christine Quinn made Wednesday morning, after the council, led by Councilwoman Margaret Chin, struck a deal with the South Street Seaport’s private developer to open two new food markets in an area previously known for its historic Fulton Fish Market. In an agreement made Tuesday, a day before the council greenlighted a proposal to overhaul Pier 17, developer Howard Hughes Corp. consented to establishing two new food markets at the South Street Seaport. One of the markets, which will be open seven days a week, will occupy at least 10,000 square feet in the Tin Building—a landmarked building that the developer had the option to commercially redevelop. That market won’t open for at least another few years. Howard Hughes has also said it plans to open a food market in the Link Building, next to the mall on Pier 17, sometime before October 2014. Meanwhile, Howard Hughes has until October to present redevelopment plans for the New Market Building, which, along with the Tin Building, was home to the former Fulton Fish Market. The plans will undergo the same Uniform Land Use Review Procedure (ULURP) process as Pier 17, Quinn noted. 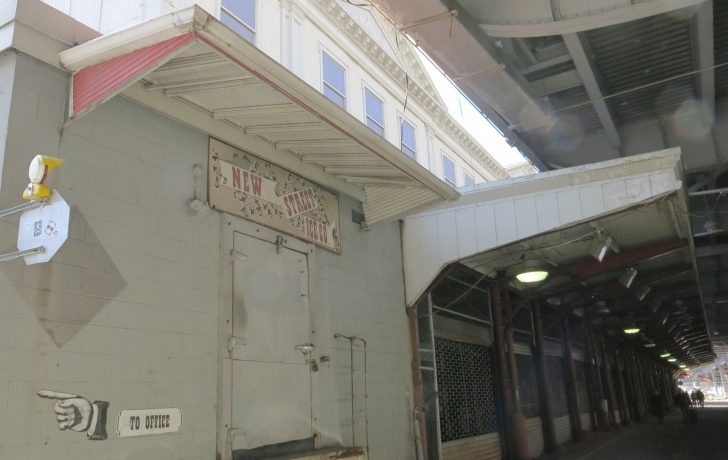 Robert LaValva, the founder of the New Amsterdam Market, has been lobbying the city for years for the opportunity to move the market into the New Market Building and the Tin Building. The market's 50 vendors have been setting up their stands every Sunday for the past eight years in a parking lot in front of the New Market Building. Quinn said that she would encourage LaValva to bid on the new marketplace during the search for an operator. “We hope to work with New Amsterdam Market to find the best space for them that they can use,” she said. Who will be in charge of that search? But he compared separating the Tin Building and the New Market Building to cutting the Statue of Liberty at its feet. Another part of the city’s deal with Howard Hughes will delay the start of construction at Pier 17 until October, to allow the pier’s shops to stay open through the summer and early fall. Chin and Community Board 1 had supported the merchants' plea to remain open during the summer in order to recoup losses after Hurricane Sandy. In addition, all Pier 17 tenants who are “in good standing” with Howard Hughes, their landlord, will have a chance to return to the pier’s new mall, Quinn noted. Those interested in coming back must present a proposal to the developer by Aug. 9. At the council’s urging, Howard Hughes also agreed to allow free public access to the mall’s entire rooftop, and to donate rooftop space up to four times a year to community groups. Finally, the council is requiring that Howard Hughes submit a detailed plan for docking at the future pier by June 30.